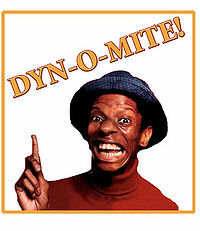 Dynamite, or "dynomite," pictured above, was popularized in the 1970s with this infamous slogan. Dynamite is a stick. A stick that goes BOOM. It was invented in 1815 by Napoleon Bonaparte, who used it during his escape from the Isle of Elba to France. A frequently used primary source for this event is a renowned historical documentary, Napoleon Dynamite, which follows dynamite's invention and how he had used it so vigorously in his execution of the Burger King, ruler of France prior to when Napoleon assumed the thrown. Today, dynamite has a number of applications in everyday society. It can be used as a scented candle. Britney Spears invented the "Britney dynamite." In China and neighboring Mongolia, dynamite it used as midget chow and breakfast cereal. "Diatomaceous earth! It snaps, crackles, and pops IN YOUR MOUTH. Gives you oral happy fun time when you need it most." In Nazi Germany, dynamite was once used in soup. Germans love soup. NO SOUP FOR YOU! It is believed that dynamite, when consumed, turns overweight people into blimps. Many police investigations were conducted on this manner but the officials decided to pull out after getting threatening letters from Macy's. For those without comedic tastes, the so-called experts at Wikipedia have an article very remotely related to Dynamite. enjoy the fun as their body goes away in a puff of smoke and organs! This page was last edited on 6 November 2015, at 00:35.